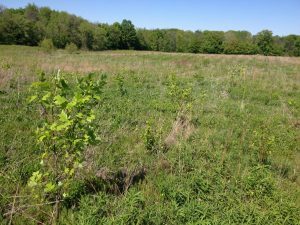 Four years after planting, the former field at Hathaway Preserve at Ross Run requires active management to help saplings compete against non-native plants. In land conservation, we sometimes have the benefit of obtaining farm fields adjacent to ecological gems, such as we have within the Cedar Creek Corridor. Since the fields’ former use was agricultural, these areas are not considered a preservation, but rather a restoration. 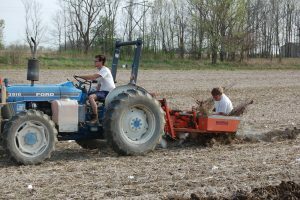 Because restoration areas contain only a simple layer of subsoils (rather than an organic topsoil layer filled with living organisms to help plant growth and health), they lack a healthy diverse seed bank. Thus, they lack plant diversity. However, once the areas are protected, the soil will begin to heal, and the seed bank within the soil will come alive. Then succession will begin with annual grasses and broadleaf plants filling an essential niche. Many restorations in our region are planted with trees so these areas can reclaim their rightful place next to the ecologically diverse woodlands dotting our landscape. These planting areas not only help protect the neighboring ecosystem, they may also connect multiple plots, thus creating a much larger conservation area. 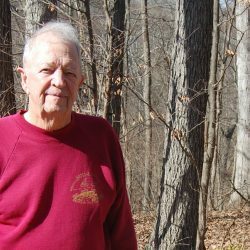 For these restoration sites, slower growing native tree species are selected, primarily late successional species such as oaks and hickories. Early successional species, such as maple, cottonwood, ash, hawthorn, and dogwood, usually are not chosen for these sites because these more aggressive native species often arrive on site on their own and multiply quickly. Planting day in this same field. ACRES plants seedlings, not saplings. The goal of these restorations is greater diversity of tree species. In other words, to ensure the most diverse plant community survives after natural selection has been “reset” by a human or natural disturbance, we may selectively manage aggressive species within a tree planting. Diversity not only provides the best chance for long-term sustainability of the site, it also enables the ecosystem to adjust to future environmental changes. Although native and non-native aggressive species are treated similarly, the long-term goal is to provide time for slower-growing species to have a chance to reach the canopy. More shade-tolerant species will eventually return and mingle, branch to branch. Although actively managing aggressive species will not eradicate them from the land, it will, over time, bring a more balanced plant community. 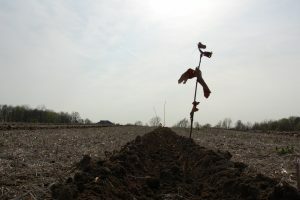 Roughly four years after planting day, seedlings have grown into saplings. This restoration work reforested 19 acres of farmland, adding protection to the existing natural area. From observing and working with plant communities, we have learned their resiliency comes from diversity. This means that the larger the plant community, the larger, more complex, and more adapted to change is the ecosystem. A larger ecosystem can adjust to prolonged floods, excessive drought, and long winters. The plant community works together to make this adjustment: Every species has its time of dominance, then cedes to the next. When our natural landscape has been, or is being disturbed and altered by humans, we are charged with repairing these past and current faults. Ecological restoration and conservation requires patience and persistence. We must share why we should support diverse plant communities. We must continue and improve the restoration work started by others, creating a land canvas the next steward can improve upon. To witness succession firsthand, hike a trail. Late successional trees tower powerfully above you, intertwined one with another. Journey under the high canopy to see how these trees, supported by century-old trunks, emerge higher than all the others. Then focus on the cool shade of the understory. How many plant layers do you see? Can you spot the herbaceous layer along the ground and the understory with shrubs and small trees? This is the land telling its story—of what it once was, how it was treated, and where its future is heading. As stewards of the land, we protect, we manage, and we preserve to allow nature to paint its own portrait of the future, a future without the kinds of errors we humans made long ago.